Submitted by Alexander Briones on Mon, 30 Mar, 2015. In May 2013, International Space Station Commander Chris Hadfield uploaded a video of him playing a Larrivée parlor acoustic guitar in space, and needless to say, their space+astronaut+guitar formula was an instant hit. The popularity of the video extended the reach of the company and helped spark the resurgence of interest for small body parlor guitars. Moving forward to the present, Larrivée has since moved their guitar building facility and operations to California, USA and continue to produce various types of instruments. The latest of which is the special edition P-03Z, an all-solid parlor guitar with exotic tonewood for the back and sides, crafted from solid Zebra wood (also called Zebrano). 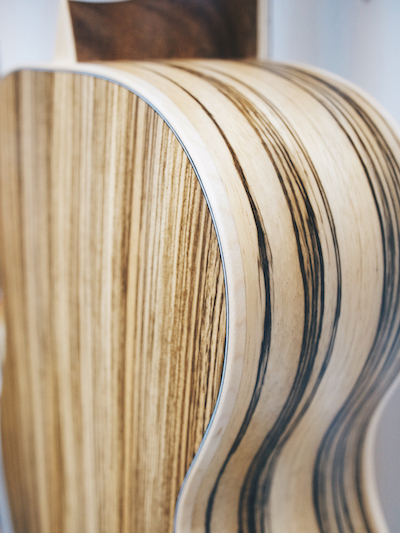 Zebrawood is an interesting choice for a parlor guitar because of its density sits in between mahogany and rosewood. When compared to mahogany, it is known to subtly increase the lower midrange, which will further enhance the already emphasized midrange of the parlor guitar shape. The result would be a midrange'y tone that would complement other acoustic guitars well in a band or jam setting, and would be great for cutting melodic lines in recordings. Following the specs of the regular P-03 model, the new P-03Z has the same parlor guitar body shape. The zebrano back and sides support the solid Canadian sitka spruce top, the company's favorite topwood which they use on many of their guitars. The top also features the Larrivee's symmetrical parabolic X-bracing, which is said to improve top resonance. The edges of the body are bound using Canadian maple for added aesthetic effect. The neck is crafted from a single piece mahogany topped with an African Ebony fretboard. It has 18 frets that are spread out across its short scale length design, measured at 24". Nut width is 1.75", resulting in familiar string spacing that will allow easier transition to a parlor guitar if you are used to bigger bodied acoustics. Microdot fretboard markers serve as discrete guide for your fretting hand. The neck meets the body at the 12th fret, following traditional parlor builds and it joins the body via a hand fit dovetail neck joint. The fingerboard is bound in ivoroid to complement the body binding. Other features of this parlor guitar include the distinct rounded Larrivee headstock shape, white inlaid logo, 18:1 ratio Ping Tuners, African ebony bridge, multi-strip inlaid rosette and an exclusive beveled Tortis pickguard. The Larrivée P-03Z is now available through their UK distributor SoundTech with a suggested retail price of just under $1,600. It comes bundled with a hardshell case and includes a Limited Lifetime warranty. No news yet if this will US made guitar will be available in the USA. For more information, head over to SoundTech.